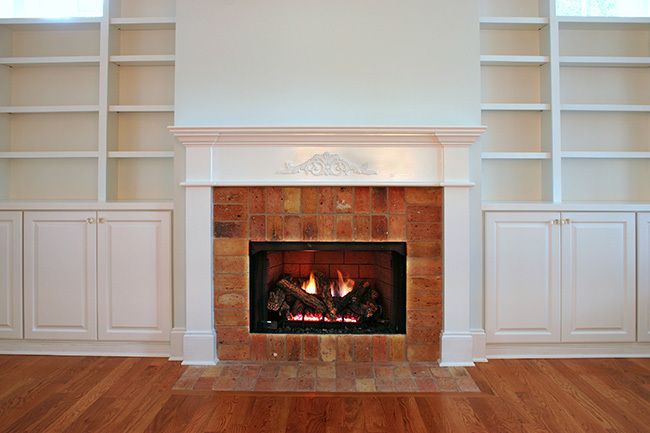 Home > Blog > How Much Maintenance Does a Gas Fireplace Need? How Much Maintenance Does a Gas Fireplace Need? Fireplaces are the staple to any home subject to the four seasons. Fall and winter would certainly lose their charm without a fireplace to gather around, warm up to and set the atmosphere when the days become darker and the nights become longer. Maintaining a fireplace is as important as maintaining anything else in your home, and by knowing what needs to be checked, cleaned, and inspected, you can prolong the lifespan of your gas fireplace while prioritizing safety. Wood fireplaces are known to have more maintenance, but many people don’t want to part ways with their beloved wood-burning fireplace because of its authenticity, nostalgic smell and the unbeatable sound of wood crackling. That hasn’t stopped the sale of gas fireplaces, however, and nowadays, gas fireplace sales are soaring. While there are a handful of devout wood fireplace lovers, the rest of us are attracted to the low maintenance of its cousin fireplace—gas. Unlike wood, there’s no ash left behind from a nightlong fire, no soot, debris, or half burnt chunks of wood. For the fireplace owner, this means less day-to-day clean up. 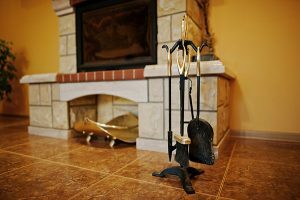 The main attraction to gas fireplaces is because of this hassle, and without bending over and scooping up the ashes, getting your hands blackened and dirty, a gas fireplace really seems too good to be true. 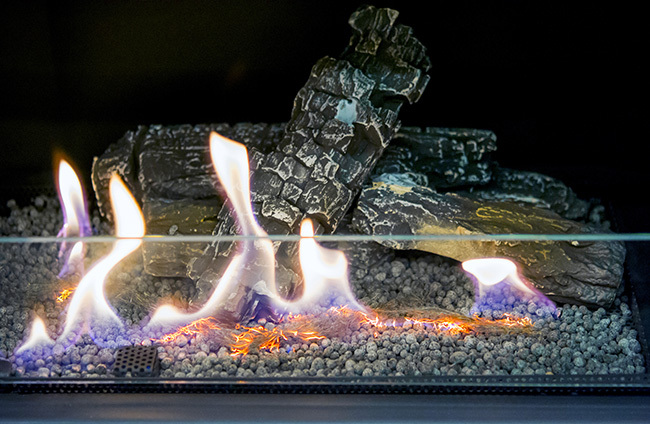 While there may be an absence of daily cleanup for your gas fireplace, there are still a few steps you must do for its maintenance, which brings us to our next point. Gas fireplaces do require less upkeep than their wood counterpart, but the maintenance is still there. The simple equation of gas-and-fire should be routinely checked because even though you don’t have the same upkeep as a wood-burning fireplace, anything flammable still requires a yearly inspection. 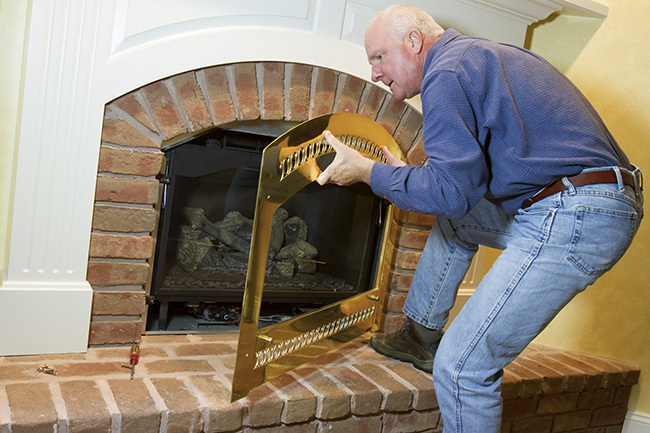 Hire a professional fireplace inspector who is certified to perform your annual safety check. The technician will clean your fireplace, which if it’s gas, should consist of some type of ceramic log that mimics the shape and look of real wood. Part of the cleaning process tackles these decorative pieces, removing dust, pet hair, debris, and other grime. Your technician will probably be using some kind of vacuum and specially designed soft bristled brush. Your inspector will check for any natural gas leaks and ensure that the fireplace is venting properly through the chimney. A professional technician will also make sure that there are no obstructions in the chimney and there are no potential carbon monoxide leaks, something that can be deadly to anyone inside of the house. The entire inspection usually can be done in under an hour, and with it being so speedy, there’s no excuse to not have this scheduled on an annual basis. With safety on the line, having an inspection completed is a no-brainer. Yes, you can clean your gas fireplace yourself, but it’s important to read the manual and make sure you follow all of the steps correctly, prioritizing safety. Before you do anything, make sure the gas is turned off first because you don’t want to accidentally ignite anything and hurt yourself! Any handheld vacuum can be used to clean the dirt out of the fireplace, carefully guiding it around the decorative logs and lava rocks. Clean the screen in front of the fireplace and the fireplace surround, ensuring that you are using the right cleaner for the job and thoroughly removing grime and build up. Periodically check the lava rocks (the rocks that heat up when the fireplace is on), and if any are showing signs of breakage, wear or tear, then replace them right away. The same approach goes for the logs. As a warning for a safety concern, if you have a glass covering for your fireplace screen, note that these can become extremely hot to the touch. Children playing near a gas fireplace should be educated on keeping away from contacting these glass protectant screens because if touched, the heat can cause serious injuries and burns. Even if you opt to clean the fireplace yourself, it’s still a requirement to have an inspection—yearly, at the very least. Inspections of a gas fireplace don’t take long to conduct and won’t break the bank. Your chimney should be cleaned annually, as well, to clear away any debris and nesting materials from animals. You might think that with the easy operation of a gas fireplace, you’re in the clear for smooth sailing with zero issues. But stop to consider that your gas fireplace is still functioning, using a flammable substance to keep fires crackling through the night, and if it’s never checked it could be a potential danger. Problems can occur in any fireplace, and a gas fireplace is no exception. According to the Chimney Safety Institute of America, a few issues like incomplete combustion and condensation are the leading cause of chimney and fireplace malfunctions. For an incomplete combustion to occur, the chimney is too cool to create a draft, and this fails to provide a substantial combustion air. Without a draft, your fireplace can produce carbon monoxide, which lingers in the chimney, sometimes spilling back out into the living area instead of being pushed up and outside the house. No one wants condensation in their home, and if it’s occurring in the fireplace and chimney area, then it could be a sign of something going awry. Condensation is not exactly a separate problem from the common incomplete combustion issue that many dysfunctional chimneys face. Condensation is more like an indication of improper draft and temperature. A little extra water may not seem harmful, but it’s actually highly acidic and can even be corrosive. This water produced within the chimney has been contaminated and can begin to eat away at the mortar and masonry. Yes, gas fireplaces do burn clean and there’s no presence of creosote or soot in the chimney, unlike a wood-burning fireplace. 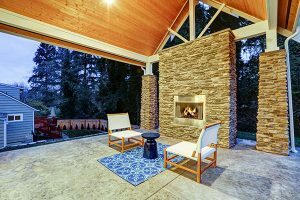 The chimney still plays an essential role in ventilation for a gas fireplace, and if there’s anything wrong in its structure, the passage of the draft is compromised. 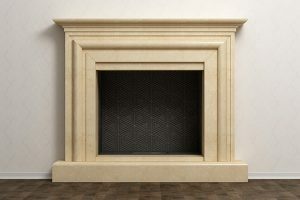 For your gas fireplace, keep an eye out for damp patches on the surrounding walls (interior or exterior), white stains on the outside brick of the chimney, crumbling bricks, cracked paint, separated and peeling wallpaper, stains near the chimney or on the ceiling above it, and eroding mortar joints. All of these are indications that something is amiss in the working parts of your chimney and you shouldn’t use it. If you see the presence of any of these concerns, then it’s time to call in a professional. 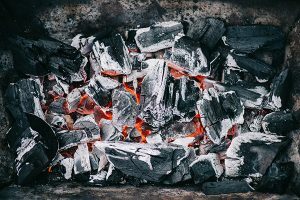 There’s a lot going on with the functionality of a chimney, and when there is flammability, corrosive condensation, and the potential of carbon monoxide, then a safety check by an expert is not a bad idea. Over time, the fireplace can show signs of wear. Valves and other connectors can erode or malfunction, and when gas is involved, that is a risk you don’t want to take. Fireplace maintenance can be easy if you hire the right professionals who can inspect and clean your chimney. At Early Times, we have certified professionals that make your chimney and your home, much safer. Since 1985, we’ve kept Chicago and surrounding suburbs clean with our professional inspection and cleaning for an unbeatable value. Speak to a specialist and get a free quote today.